Mother Mallard's Portable Masterpiece Co. celebrates its 40th Anniversary! Mother Mallard's Portable Masterpiece Co. will present its fortieth-anniversary concert featuring two world premier performances of music by composer David Borden. Sponsored in part by the Cornell Council for the Arts. Sunday, March 29, 2009, 8:00 p.m.
David Borden is one of America's most accomplished classical minimalist/post-minimalist composers. His standing as a composer belongs besides that of such long-recognized masters of minimalism as Steve Reich, Philip Glass and Terry Riley,who are the same generation as Borden. Borden's cyclic composition, "The Continuing Story of Counterpoint", released on a series of three CD by Cuneiform, is a recognized masterpiece of the minimalist genre. If you would like to request information on these or future concerts involving David Borden, please contact Rebecca Godin: rebeccagodin@mac.com. If you would like to request information on releases featuring David Borden/Mother Mallard on Cuneiform, please contact Joyce @ Cuneiform: joyce@cuneiformrecords.com. 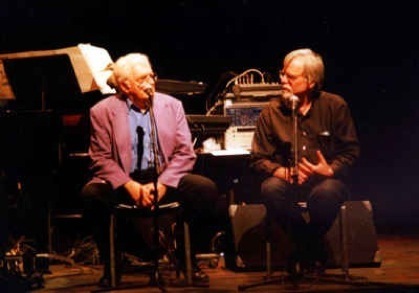 When Robert Moog, inventor of the voltage controlled electronic synthesizer, introduced David Borden to his newest creation, the groundbreaking experimentation and creative performances that followed would echo throughout music history for decades to come. Formed in 1969 in Ithaca, the Mother Mallard's Portable Masterpiece Co. was one of the few to begin experimentation with such equipment, earning them a place in history within an exclusive group of pioneers such as Terry Riley, Philip Glass, and Tangerine Dream. Critically acclaimed as a group whose work was ahead of their time, the ensemble would set groundwork for the experimental classical minimalists and live synth-ensembles of the future. The group performs now using laptops to produce their distinct sound, but still pays tribute to their roots by featuring a Moog Voyager, Dr. Moog's last synthesizer design. The upcoming 40th anniversary concert will take place in Barnes Hall at 8:00 PM on Sunday evening March 29th. Three pieces will be given world premiers. The featured piece will be “Viola Farber in 7 Movements” with live video showing Farber’s dancing and choreography both as a soloist and with her company. In addition, a section from Borden’s “The Continuing Story of Counterpoint” that was composed in 1979 will receive its first performance. And finally, a piece honoring Jimmy Giuffre, the gifted jazz composer and clarinetist/saxophonist will be premiered. Giuffre was Borden’s first composition teacher. He died last April at the age of 87. 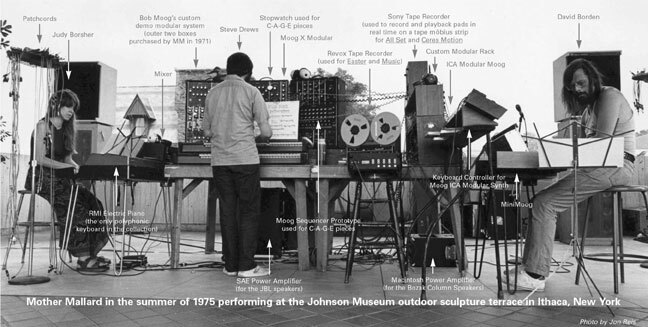 MMPMC started as an ensemble that performed on three Modular Moogs, two MiniMoogs, and an RMI Electric Piano. Now MMPMC uses MIDI Controller keyboards attached to Apple computers via USB and an electric guitar. Bob Moog's personal synthesizer demonstration unit that he traveled with in the late 1960s will be on display along with an early MiniMoog. These instruments and others were caught in a photograph by Jon Reis in 1975 while the band was performing at the Johnson Museum. The photo was blown up into a poster which will be present at the performance, and which appears at the top of this email. All music on the program was composed by David Borden. Mr. Borden taught at Cornell for 37 years. For the first 19 he was Composer/Pianist for Dance and for the last 18 he was founder and director of the Digital Music Program which is now called the Cornell Electroacoustic Music Center headed by Prof. Kevin Ernste. Mother Mallard's Portable Masterpiece Company; David Borden, director. Mother Mallard celebrates its fortieth year with electroacoustic music by Borden, featuring keyboardists David Yearsley, Blaise Bryski and Josh Oxford, with live video projection by Noni and Franck Vidal, and some "blasts from the past." Funded, in part, by a grant from the Cornell Council for the Arts. The first incarnation of the ensemble was called Mother Mallard's Portable Masterpiece Company, and performed pieces by several young composers of that era including Terry Riley, Robert Ashley, Steve Reich and Philip Glass. By 1971 MM was performing only the music of its three composer-performers Steve Drews, Linda Fisher and David Borden. In 1973 the group released it's first LP recording on its own label, Earthquack Records. It was enthusiastically received by critics. In 1975 Judy Borsher replaced Linda Fisher, and another LP followed (Like a Duck to Water) which was also a critical success. The ensemble found itself with a cult-like following and performed at most of the avant-garde venues in New York City. In 1977 Chip Smith replaced Steve Drews, and continued under the exclusive direction of David Borden. The group has been disbanded and reformed several times since 1978. Along the way MM has performed in New York at the Kitchen, the Knitting Factory, the WBAI Free Music Store, The Alternative Museum, Danceteria, Town Hall and Lincoln Center. In Europe MM has performed at the Barbican Center in London, the Portsmouth Festival and The Tivoli Koncertsalen in Copenhagen, Denmark in addition to many universities and festivals in the United States and Canada. In January there will be a retrospective CD released on the Cuneiform Label featuring many of the original recordings and some previously unreleased material. Currently there are four CDs available of MM on Cuneiform, including the entire Continuing Story of Counterpoint cycle as well as some of the Birthday Variations. In addition to the Mother Mallard titles, Cuneiform released a David Borden compilation, titled Places, Times and People. 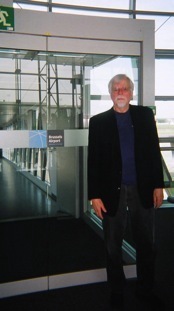 David Borden was the Director of the Digital Music Program at Cornell University where he has been teaching since 1968. Before coming to the Music Department in 1987 he was Composer-Pianist for Dance in the Department of Women's Physical Education (now defunct) and the Department of Athletics. He earned his undergraduate degree at the Eastman School of Music and holds Masters Degrees in Music from both Eastman and Harvard University. He first came to Ithaca in 1966 on a Ford Foundation Grant as Composer-in-Residence for the Ithaca City School District. Before that, he attended the Hochschule für Musik in Berlin, Germany as a Fulbright student. His teachers have been many: Leon Kirchner, Gunther Schuller, Howard Hanson, Bernard Rogers, Wolfgang Fortner, Boris Blacher and Aaron Copeland. His first composition teachers were jazz musicians: Jimmy Giuffre and Jaki Byard whose influences can still be heard in his music. His music has been performed the world over. “… big modular Moog synths, beefy chunky electronics in dazzingly complex arrays, ably turned out by three dextrous musicians." "A marvel of pioneering electronica. "-The Wire. “Before German bands like Kraftwerk and Tangerine Dream brought electronics to center stage, the path had already been broken in the U.S. by Mother Mallard’s Portable Masterpiece Company…Like a Duck To Water is a CD re-release chronicling MMPMC’s work from 1974-76. Their music draws inspiration from Robert Ashley and Terry Riley’s explorations into minimalist repetition. The compositions are absolutely gorgeous, with layer upon layer of repeating rhythmic phrases that gently shift their flow with the purposeful effortlessness of a Zen meditation. “This album is a trip back in time to the days when MIDI was just a weird dream and the demagnetizing of tape heads had to be done every half hour or so because the direct waveforms were asymmetric enough to kill their ability…A time when live really did mean live, and playing more than one note at a time meant having to have at least two synthesizers within easy reach. …Musically, as you can imagine, there are a lot of repeating monophonic arpeggiated sequences involved throughout their music, with hand played parts moving in and around the loops, similar to the way that Tangerine Dream used to set up their now trademark opuses, but without the obligatory grandiose entrance of a drum track to tie it all together…Instead Mother Mallard will get deeper into the loop, working around it in ever widening and alternately ever decreasing circles, never losing control but taking things to their limit nonetheless. “David Borden is a minimalist composer, with medieval roots... The Continuing Story of Counterpoint is a set of elaborate contrapuntal melodies that sometimes rush by like Guillaume de Machaut on amphetamines, at others like a slow-motion aerial ballet. Borden’s interwoven lines unfold like Melvin Prueitt’ds computer design, Wing, twisting and turning in three dimensional space, each shift of the perspective revealing new facets. The relentless precision of his synthesizer arranged lines are balanced... by the pure soprano of Ellen Hargis. Intoning the names of contrapuntal composers and techniques, it makes this music sound like a 14th Century hymn sung in space. “Minimalism, for those unfamiliar with the genre, is a compositional style with roots in traditional eastern music. It is based on rapidly repeating cycles of notes, gradually being altered as the piece moves on. There are generally two distinct sound layers, one moving frantically and hypnotically about a slower and majestic bottom layer. Minimalist compositions are generally for a small ensemble...Borden’s song cycle... is one of the finest examples of minimalism for a small ensemble. “Borden has contrived to establish intricate and sometimes obscure musical relationships among all twelve parts of the series....the music is often involving and quite beautiful -- in a civilized, understated way. ...Borden does seem to have a general aesthetic affinity with the early Baroque period, when music had a generalized spiritual quality and the individual ego was subordinated to a larger world of musical, philosophical and theological ideas. Not that Borden’s work is overtly religious, but it does commit itself to certain large-scale ordering principles, which distinguishes it from the eccentric and often egotistical self-expression of later periods in classical music. One of the unusual characteristics in Borden’s work, especially on this CD, is the combination of hyperkinetic 16th note patterns and long, floating drones, which creates an aural illusion of music which is racing forward and standing still at the same time.This is especially true of the three section of Part 8, which have a softer, slightly more romantic sensibility than their companions, and are probably the most compelling pieces on [this] CD." “Of the minimalist school, David Borden is probably one of the most undeservedly obscure. The founder of Mother Mallard Portable Masterpiec Co., Borden has been quietly releasing a series of astounding records since the early ‘70s that incorporate his love of pre-Renaissance liturgical music, synthesizers (both analog and digital) and what he’s learned from LaMonte Young. Counterpoint...ultilyzes just about every compositional trick in the book. The music is smoothly paced, with odd time siugnatures and wondrously atonal, yet consonant, voicings. It also has no new age pandering nor is it ponderously academic. “The Continuing Story of Counterpoint is unambiguously signified by its title...the audible results are a series of segments which display an insistent but undaunting complexity born of interlocking musical elements, somewhat in the manner of Glass’s Music in Twelve Parts or Milesis’ Modi I And II. Borden’s music, however, develops with its own kind of pace. Seemingly reluctant to take this systems thing too seriously, Borden allows his themes to become established and then artfully tinkers with them just enough to keep you interested. The music which results is harmonious, euphonious and generally emotionally uplifting without being deficient in the necessary compositional discipline. Most of all, the human elements in this system are important in a way to which... Michael Nyman has alluded, in that the performers of this particularly demanding kind of music are not idealised interpreting machines but people... This seems to be explicit in Borden’s approach, or maybe its simply coincidental that his music exhibits a healthy emotional depth. “David Borden is a no-nonsense, roots minimalist, one who kept the faith of bracing 16th notes and keyboard dominated small groups...Borden’s forte is a streamlined harmonic sensibility influenced by early European music, and a crisp rhythmic drive devoid of obvious ethnic models...Borden has also astutely read the sign of the times, astutely integrating computer-driven samples and sequences, and small doses of improvisation." “The complete Story is a twelve-part musical cycle based on strict counterpoint that kept Borden busy from 1976 to 1987. Despite the music’s rigorous internal logic, the minimalist tale offers the kind of textured attractiveness on the surface that could pass for background music in The Exorcist, Part 12. “”What we have here is a variety of well-conceived compositions. The minimalist style keeps the arrangements clean and uncluttered... A fine album. THANK YOU FOR SUPPORTING ADVENTUROUS MUSIC! If you have received this email in error and want to be removed from Cuneiform's email news list, please ask me [Joyce] to 'PLEASE REMOVE"
ECHOES by John Dilberto: 1994 Ancient Echoes: "David Borden and Mother Mallard"
ECHOES by John Dilberto: 2003: Moog’s Mavens: "David Borden: The Moog of Mother Mallard's Portable Masterpiece Co."
"Minimalist compositions are generally for a small ensemble... Borden’s song cycle... is one of the finest examples of minimalism for a small ensemble." "When released in its entirety, this series may stand as the “Goldberg Variations" of minimalism, a canon of work that defines a style and an era." Click here for more information on David Borden's releases on other labels including CRI, Aribter & Sony. 1976: Edin Vélez' (5:19) movie, "Mother Mallard's Portable Masterpiece Co.": MMPMC playing Steve Drews' "Waterwheel", band commentary & Moogs in action (NYC & Ithaca). Movie was published on the 2001 CD - Like a Duck to Water (Cuneiform). Learn about the Bob Moog Memorial Foundation for Electronic Music. 2000 (April 15): Mother Mallard in Concert w Keith Emerson, “The Keyboard Meets Modern Technology”, Carmichael Auditorium, Museum of American History, Smithsonian Institution, Wash.D.C.